We have information you must know before you buy the 718 Cayman. The Porsche 911 might have all the name recognition, but don't let that kid you into discounting the entry-level 718 Cayman. 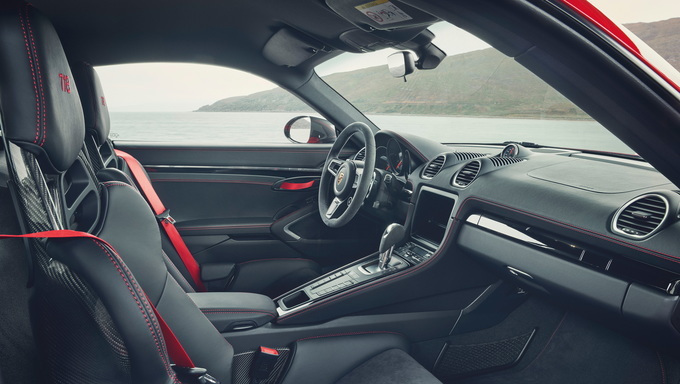 With two seats, a smaller shadow, and less weight, the 2019 Porsche 718 Cayman offers a full helping of the revered driving experience the brand's known for. 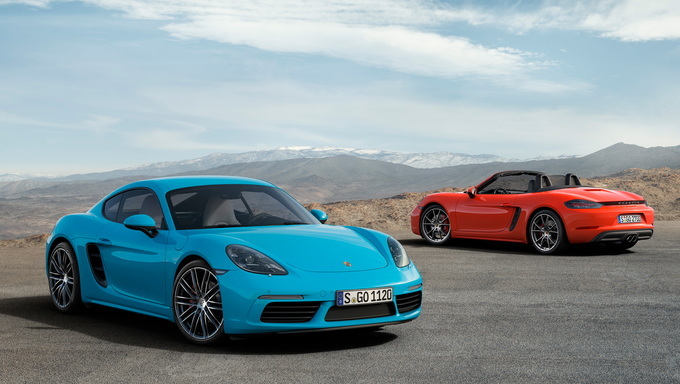 Indeed, some might consider the tidier-sized Cayman to be more of a pure drivers car than its bigger brother. But whether it's viewed in the light of the 911 or no, the Cayman is sure to delight. The 718 Cayman family grows by two this year with the addition of the Cayman T and the GT4 Clubsport. The T (for Touring) is similar in concept to the 911 T, in that it comes standard with all the normally-optional performance goodies but leaves aside any extra luxury touches. In the world of Porsche, the T is also a bit of a bargain, with the marque promising it'll ring up five to 10 percent cheaper than a comparably-equipped base Cayman. The GT4 Clubsport is another beast entirely. Built for both amateur and professional racers, the 425-horsepower GT4 boasts a suspension and braking system from the 911 GT3 R racer and a full safety cage, racing bucket seat, and six-point harness. It's not road legal but can be serviced at any Porsche dealer. Porsche is notorious for offering their cars à la carte, but the 718 is thankfully much less of a multi-model smorgasbord than the 911. Four trim levels (not counting the specialized GT4) anchor the lineup, all of which sport a 2.5-liter turbocharged four-cylinder engine. The regular model and the T both make 300 horsepower and 280 pound-feet of torque; the S pushes 350 horses and 309 lb-ft of torque. 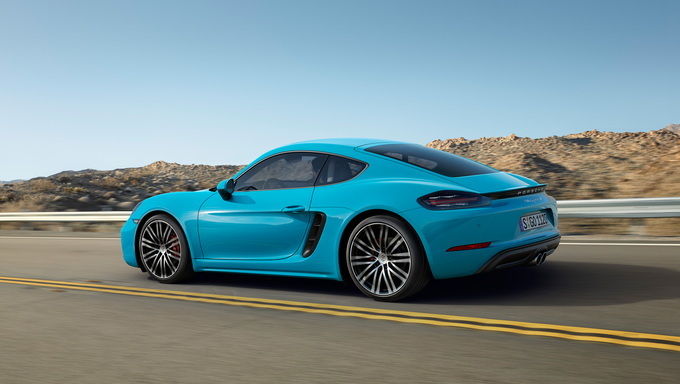 The extra power of the hot-rodded S allows it do zero to 60 mph in 4.4 seconds with the manual transmission, which is a half-second quicker than the regular stick-shift Cayman. When equipped with the seven-speed PDK dual-clutch transmission, that same run can be as quick as four seconds flat for the S or 4.5 seconds for the non-S. The GTS uses the same 2.5-liter flat four, and compared to the S, it offers 15 extra horsepower and no additional torque. On first blush, it might seem rather odd that the power differential between the S and the GTS is so minute. 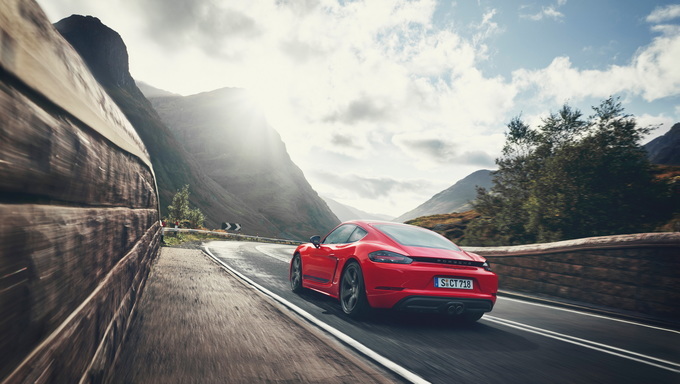 But the GTS isn't as much about outright speed as it is about providing the most thoroughly balanced and performance-attuned driving experience within the lineup. It accomplishes this in the same manner as the philosophically-similar T: bundling all the worthwhile performance pieces at a price cheaper than if one were to similarly option up an S. Look at the GTS through this lens and suddenly those measly 15 extra horsepower seem less like a disappointment and more like a cherry on top. As with the 911, Cayman options run amok. Space constraints keep us from listing out every available option; otherwise, there'd be multiple paragraphs denoting prices for tchotchkes like leather-covered key fobs and embroidered headrests. Also note the 718 Boxster is available. It's identical to the Cayman in every way save the fact that it is a convertible; indeed, it's best thought of as the convertible variant to the hardtop Cayman. A separate article will cover the Boxster's pricing and specifications. The cheapest way into a 718 is the $58,150 (all prices include the $1,250 destination charge) base model, simply titled 718 Cayman. 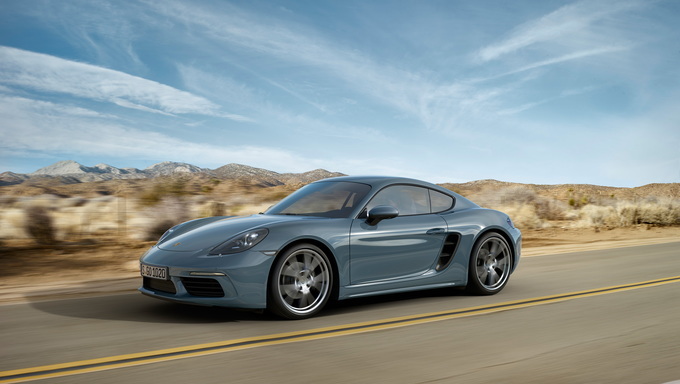 Along with the T, the standard Cayman uses the 300-horse version of the 2.5-liter engine. Standard mechanical features include a six-speed manual transmission, start/stop functionality, 18-inch wheels, four-piston brake calipers paired with slotted and drilled rotors, an automatically extending rear spoiler, and a sport mode. The cabin reflects the Porsche maxim of purity and essence. Don't spend a dime on extras and you'll get manually-adjusting seats, a manually-adjustable tilt and telescope steering wheel, a leather-wrapped gearshift, steering wheel, and door pulls, eight-speaker audio, Bluetooth, two USB and SD card slots, audible park assist, and side mirrors that are electrically adjustable and heated. More luxury is available to those willing to shell out the dough for it. Leather sport seats are $810, while 18-way power seats with memory are $3,830. A $1,370 Premium Package comes with Bi-Xenon headlights, automatically dimming mirrors, dual-zone automatic climate control, and heated 14-way power seats. There is a Plus version of this package that costs $3,180 and also comes with dynamic lighting, seats offering memory and cooling functions, remote entry and start, and ambient LED lighting. On the performance end of things the Sport Chrono Package is the choice for those looking for generally heightened performance. For $2,090, the Sport Chrono includes an analog and digital chronograph for timing laps, multiple drive modes with a steering wheel switch to toggle between them, an additional Sport setting for the stability control that dials back the intervention point, launch control for PDK-equipped cars, and a rev-match function for manual-equipped models. 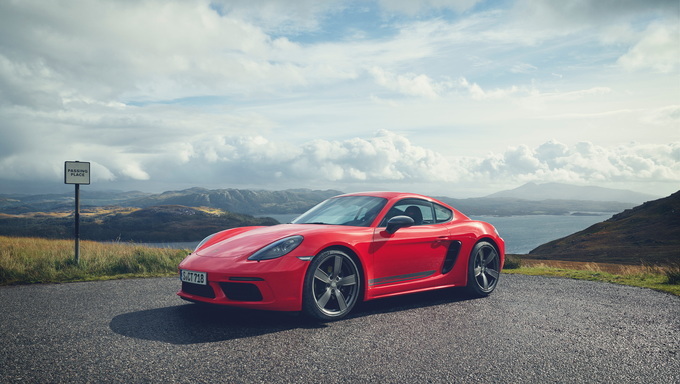 New for 2019 is the Cayman T. Due to late availability the exact pricing is still unknown, though from what Porsche has alluded to a figure somewhere in the low-60k range wouldn't be all too surprising. What's not a mystery is the list of included performance bits. All will be built with the PASM suspension that lowers the car 20 millimeters, an electronically-controlled limited-slip differential with torque vectoring, shorter gearing, and the Sport Chrono Package. To drive home the point of the T, Porsche leaves out the infotainment system, with nothing but a large black cubby in its place. If this sounds too extreme, it's a no-charge option to add it back. Rounding out the T are 20-inch wheels, grey mirror caps, trim-specific embroidery, and a sport exhaust. Those thirsty for power will find plenty of it in the 350-horsepower Cayman S. The $70,550 starting price represents a $12,400 premium over the base model; consider that amount the tax for netting 50 extra factory horsepower. In fact, the only non-performance difference between an S and non-S is the 19-inch wheels included on the S. As such, all options and packages remain the same as what's available on the base car. The GTS is the cream of the Cayman crop. 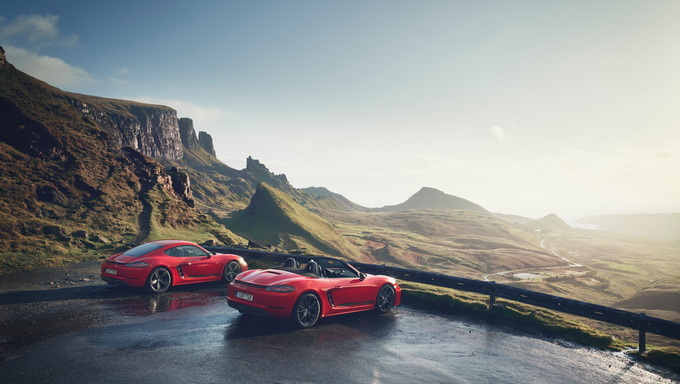 Priced at $81,950, the GTS pairs the best performance features in the Porsche catalog with a 365-horsepower version of the 718's 2.5-liter engine. The list of standard goodies reads almost identical to that of the T: Sport Chrono, torque-vectoring rear differential, sport exhaust, 20-inch wheels, the PASM suspension with a 10 millimeter reduction in ride height. Other than an interior upholstered in Alcantara, comfort and convenience features and available options remain unchanged from lesser Caymans. We'd look to the upcoming T as our choice of the 2019 Porsche 718 Cayman litter. Despite using the most tepid version of the 2.5-liter engine, the raft of performance features as well as the shorter gearing promise to make this variant the most thrilling of the bunch for hustling along a winding back road. As for the dizzying array of options, we'd keep it simple by getting the Premium Package and nothing more. Awe-inspiring performance. The 2019 Porsche 718 Cayman may be the brand's entry-level option, but few can handle corners with the same aplomb. 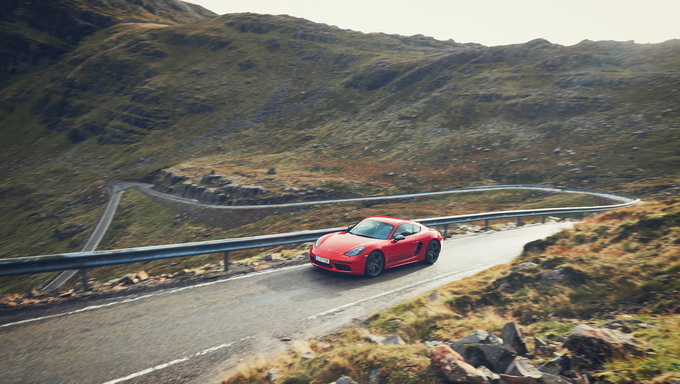 With a mid-engine design, the 718 Cayman is quick, agile, and incredibly balanced. In typical Porsche fashion, feedback is excellent and the suspension is perfectly damped for spirited driving. The most potent model, the 718 Cayman GTS has a turbocharged 2.0-liter four-cylinder engine that pumps out 365 horsepower. With that much power in a small package, the model can get to 60 mph in just 4.4 seconds. Those figures are far from entry-level in any sense of the word. Exotic design. The 718 Cayman is a gorgeous vehicle from any angle. Sculpted lines replace the old model's softer edges, while a sharper overall design gives the sports car a more aggressive feel. For such a small vehicle, the sports car comes off as being muscular. On the inside, the 718 Cayman has enough buttons to make you feel like you're working at NASA. Busy? Yes, but it's driver oriented and beautiful. High-end materials envelop two passengers, while the steering wheel is from the 918 Spyder. Strong list of equipment. 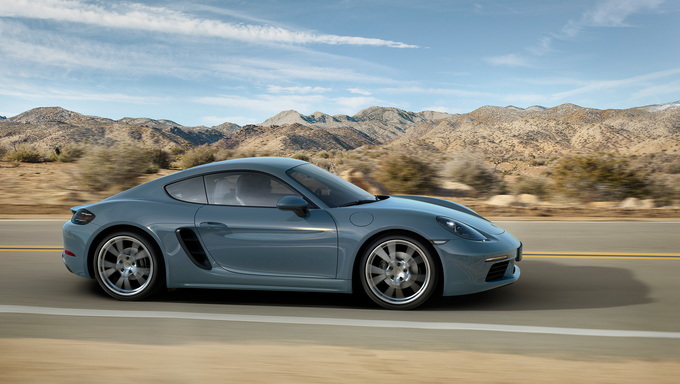 With a starting price of $58,150, the 718 Cayman comes with a good list of standard features. Things like an eight-speaker sound system, a universal garage door opener, front and rear parking sensors, a rearview camera, automatic climate control, sport seats, and a sport steering wheel are all standard. Climbing up the ladder reveals more luxurious options. Tight on space. While the cabin itself is relatively spacious for two people, cargo space is downright small. With a mid-engine design, you get two cargo areas: a frunk and a trunk. Between the two, you're looking at a total of 15 cubic feet of available cargo space. Getting into the vehicle is a reminder of why staying limber is important, as some will find ingress and egress tricky. Those not attending a regular yoga class might want to start if they plan on purchasing. Final thoughts. 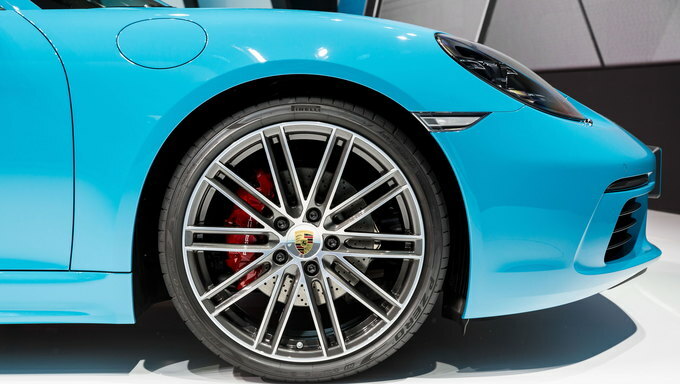 Very few cars get close to being perfect, but the 2019 Porsche 718 Cayman gets awfully close. There's very little to fault with the sports car, which makes it a must-drive vehicle. Unfortunately, it's not cheap. Sports cars like the 718 Cayman are meant to be enjoyed on a winding road, but the Porsche also manages to be easy to drive. And because of its compact size, you won't have anxiety when trying to park. If only it weren't so expensive and had better fuel economy. The 718 Cayman doesn't have a lot of competition. The BMW M2 has more horsepower and two tiny seats in the back. The Audi TT, depending on what trim you go with, has more power and all-wheel drive. The Jaguar F-Type can also be had with much more power, plus it's even better looking in our opinion. We have partnered with trusted dealers in your area to give you a great price on the new Porsche 718 Cayman.